350. IS THE CURRENT FOOD CRISIS DUE TO PEAK OIL? Dieoff - fun to watch, better with hot buttered popcorn. Some of these bottomfeeders are now trying to pretend that they predicted the food crisis. Who are they trying to kid? We all know what they predicted. They said oil would peak, and the resulting price rise would cause food prices to skyrocket due to the dependence of modern agriculture on oil for machinery, transport and fertilizer. To paraphrase Colin Campbell and Richard Heinberg: The world population rose with oil, and will decline with oil, back to pre-oil numbers. So, is that what's happening? First, world oil production isn't even dropping. The price of rice began to skyrocket in January of this year, when crude oil production was setting a new all-time record. It's gotten so bad that the CFTC (Commodities Futures Trading Association -- the agency which regulates futures exchanges in the U.S.) had to convene a conference last week to address irate farmers complaining not about the surge of diesel prices, but about the surge in speculative money causing havoc in the futures markets. Havoc to a degree that farmers are having trouble marketing their product. It seems to me we should be looking for a single explanation behind the common behavior of the group, rather than try to develop a separate theory for aluminum, barley, coffee, cocoa, copper, corn, cotton, gold, lead, oats, oil, silver, tin, and wheat. In other words, much of the price surge since Jan. 2008 is a financial phenomenon, driven by the Fed's rapid interest rate cuts. This has created negative real interest rates, causing people to flee to commodities in order to preserve value. It's the same conditions which led the Hunt Brothers to hoard silver in the 1970s. If history is a guide, the bubble will pop when the Fed pulls the trigger, and begins to raise interest rates. Another big factor, particularly in the case of rice, is plain panic, and the hoarding induced by it. Yes, the price of food has risen, and poses a threat to the well-being of the world's poorest people. Does this mean the doomer shitheads get to say "told you so", break out the party horns, and prematurely ejaculate on their gold hoards and nitropacked food supplies? Well, they're probably going to do that anyway, but back here in reality... No. There isn't a die-off until the people actually die. The current food crisis is not the die-off for a number of reasons. First of all, the currently hungry people don't need to die. They're hungry due to lack of money, and there is certainly enough money in the world to get them fed. Dog and Cat food sales in the U.S. in 2005 were $14.3 billion Source , about 20 times more money than the paltry $700 million the World Food Program now needs to address the emergency needs created by the current food crisis. A die-off, in the strict biological sense, occurs when the environment cannot physically produce enough food to sustain the population of the species in question. Therefore, even if 100 million people starve to death due to the current crisis, it won't be a die-off. Because it is patently obvious that we can feed those people if we want to. Therefore, if they are allowed to die, it would have to be labeled as what it really is -- a "let them die off"" or "kill off" or "mass murder", not a die-off. Furthermore, there is a whole laundry list of things which can be done to improve the situation. For starters, we can get serious, and shut down the corn ethanol scam. Beyond that, this article (and the related links, all well worth reading) in the latest Economist discuss some of the deeper structural changes which will be needed to keep everyone fed. Also, it's not at all clear that the current situation will be bad in the long run. Low agricultural prices have caused a lot of poverty in the past, and high food prices aren't all bad -- they bring greater prosperity to farmers and the countryside in developing countries. Only time can tell whether the current situation is a catastrophe or an opportunity. There is a misconception that geoengineering can only be applied to the entire earth. This is not really true. Geoengineering the whole earth is a little scary. Would regional scale geoengineering be possible? The idea of localized cooling is nothing new. In fact, mainstream climate science recognizes that man-made aerosols (which caused the cooling period from 1940-1970) have localized effects. In other words, humans have already done decades-long localized geoengineering to cool the northern hemisphere. We just didn't realize we were doing it at the time. Localized heating (perhaps to generate precipitation or clouds) is also within human technical capabilities using space mirrors. That may sound futuristic, but it's not. There are numerous mirrors already in space (in telescopes and imaging systems), and the USSR actually deployed a large space mirror to illumine the dark side of the earth 15 years ago in 1993 (Znamya 2). "Which is more environmentally sensitive, to let the polar bears go extinct or put some dust in the upper atmosphere?" How is humanity doing on the CO2 emissions scorecard? CO2 emissions from fossil-fuel burning and industrial processes have been accelerating at a global scale, with their growth rate increasing from 1.1% y–1 for 1990–1999 to >3% y–1 for 2000–2004. 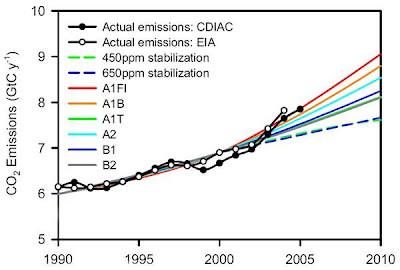 The emissions growth rate since 2000 was greater than for the most fossil-fuel intensive of the Intergovernmental Panel on Climate Change emissions scenarios developed in the late 1990s. Global emissions growth since 2000 was driven by a cessation or reversal of earlier declining trends in the energy intensity of gross domestic product (GDP) (energy/GDP) and the carbon intensity of energy (emissions/energy), coupled with continuing increases in population and per-capita GDP. Nearly constant or slightly increasing trends in the carbon intensity of energy have been recently observed in both developed and developing regions. No region is decarbonizing its energy supply. Sobering, isn't it? Since the Kyoto Treaty was signed, CO2 emissions have actually accelerated. Efforts to control CO2 emissions remind me a great deal of the war on drugs. A lot of government programs, handwringing, breathless alarmism, multinational treaties, ad campaigns, calls to redouble efforts, education in the schools etc. But none of it has any impact at the usage level. Governments everywhere are basically powerless because the people want to use the product. There is also a very similar culture of denial. If you tell a drug war supporter that their efforts aren't having any impact, it doesn't register in their brain. They don't want to hear it. Similarly, if you tell a global warming alarmist that CO2 reduction campaigns are pointless because they don't have any material effect, they get very defensive: "Don't say that! It might be the truth, but we shouldn't talk about it. It's bad for morale." It's true that we have a moral duty to try to do the right thing. But we also have a moral duty to not delude ourselves into thinking we can achieve things which we actually can't. This week's prize for honest liberalism goes to Michigan's John Dingell, who is having fun with his fellow Democrats while also making a useful point about the politics of global warming. The venerable Chairman of the House Energy and Commerce Committee--first elected in 1955--has announced that he plans to introduce as early as this week a new tax on carbon emissions. Now, that's the way to clear a Capitol Hill hearing room. Americans are already miffed at paying $3 a gallon for gasoline, a fact that has the Members assailing oil companies on a daily basis. So the last thing Democrats seeking re-election want to do is pile on another dollar or two a gallon in taxes--especially in the name of "saving the planet" from the speculative danger of global warming 50 or 100 years from now. Their voters have to deal with the more immediate danger of missing the mortgage payment. 1) The only large-scale carbon initiative on the table, the Kyoto Protocol, will have virtually no impact whatsoever on temperature, sea levels etc. This is a peer-reviewed, demonstrated fact. Now, in the last few threads, a number of people (like KarenRei) have conceded that Kyoto will do nothing, and stressed that we need to make much deeper cuts which go beyond Kyoto. My opinion is that any real proposal for doing this (and I haven't seen one yet, just a lot of hot air and self-righteous posturing) will go the way of Congressman Dingell's legislation. If Kyoto is too expensive, and impossible, even for wealthy, high-tech nations like Japan, there's no reason to believe that something far more economically strenuous will be doable. The idea that we can easily kick the fossil fuel habit with windmills and solar is idealistic nonsense. In the real world, economics trump climate concerns, and, at best, carbon control measures will be token gestures. That is the reality on the ground. 1) Paul J. Crutzen, atmospheric chemist and 1995 Nobel prizewinner for work on the hole in the ozone layer. In Aug. 2006 Crutzen published an article titled ALBEDO ENHANCEMENT BY STRATOSPHERIC SULFUR INJECTIONS: A CONTRIBUTION TO RESOLVE A POLICY DILEMMA? (pdf) in the peer-reviewed journal Climatic Change. For a quick overview, here's an article in the popular press. 3) Ken Caldeira of the Carnegie Dept. of Global Ecology at Stanford University. He writes: "The least expensive option might be to use a fire hose suspended from a series of balloons. Scientists have yet to analyze the engineering involved, but the hurdles appear surmountable. Seeding the stratosphere might not work perfectly. But it would be cheap and easy enough and is worth investigatingSource. Here's a video of Caldeira lecturing on geoengineering at Google. So, there you have it. Eminent climatologists, members of the consensus, publishing in peer-reviewed journals, boldly advocating the idea of pumping sulphur into the stratosphere to reverse global warming. Thank god somebody is shedding the airy-fairy idealism and facing the realities on the ground. This might be a very cost-effective solution. And, of course, there shouldn't be any problem vetting the safety and effects of this procedure because current climate models are highly accurate, capturing all macroscopic behaviors of the climate, and capable of making reliable predictions literally hundreds of years into the future. They drift along in the worlds' oceans at a depth of 2,000 metres -- more than a mile deep -- constantly monitoring the temperature, salinity, pressure and velocity of the upper oceans. Then, about once every 10 days, a bladder on the outside of these buoys inflates and raises them slowly to the surface gathering data about each strata of seawater they pass through. After an upward journey of nearly six hours, the Argo monitors bob on the waves while an onboard transmitter sends their information to a satellite that in turn retransmits it to several land-based research computers where it may be accessed by anyone who wishes to see it. These 3,000 yellow sentinels --about the size and shape of a large fence post -- free-float the world's oceans, season in and season out, surfacing between 30 and 40 times a year, disgorging their findings, then submerging again for another fact-finding voyage. When they were first deployed in 2003, the Argos were hailed for their ability to collect information on ocean conditions more precisely, at more places and greater depths and in more conditions than ever before. No longer would scientists have to rely on measurements mostly at the surface from older scientific buoys or inconsistent shipboard monitors. So why are some scientists now beginning to question the buoys' findings? Because in five years, the little blighters have failed to detect any global warming. They are not reinforcing the scientific orthodoxy of the day, namely that man is causing the planet to warm dangerously. They are not proving the predetermined conclusions of their human masters. Therefore they, and not their masters' hypotheses, must be wrong. Just look how tenaciously some scientists are prepared to cling to the climate change dogma. "It may be that we are in a period of less rapid warming," Dr. Willis told NPR. Yeah, you know, like when you put your car into reverse you are causing it to enter a period of less rapid forward motion. Or when I gain a few pounds I am in a period of less rapid weight loss. Does this mean global warming has stopped or reversed? Probably not, but you never know. In any case, it's quite interesting. Continuing my tangent on global warming, I loved the disconnect between the following items. Not doing it will be catastrophic. We'll have eight degrees -- we'll be eight degrees hotter in 10 -- not 10, but in 30 or 40 years. And basically none of the crops will grow. Most of the people will have died, and the rest of us will be cannibals. Civilization will have broken down. The few people left will be living in a failed state like Somalia or Sudan, and living conditions will be intolerable. This is precisely the sort of non-quantitative, asinine alarmism that makes global warming the cult it is. The overall impression, from my perspective, is that Ted Turner is just another irrelevant old fart -- like Deffeyes and Lovelock -- making a last ditch grab for the headlines by making catastrophic predictions. 2) The UN itself concedes that global temperatures haven't risen at all in the last 10 years. Due to the dominant role of coal, solution to global warming must include phase-out of coal except for uses where the CO2 is captured and sequestered. Failing that, we cannot avoid large climate change, because a substantial fraction of the emitted CO2 will stay in the air more than 1000 years. Yet there are plans for continuing mining of coal, export of coal, and construction of new coal-fired power plants around the world, including in Australia, plants that would have a lifetime of half a century or more. Your leadership in halting these plans could seed a transition that is needed to solve the global warming problem. This got me wondering about the cost-benefit analysis for such a proposal. Clearly Australia would incur significant costs by implementing Hansen's program: loss of income from coal sales, loss of sunk costs in infrastructure, increased electricity prices, potential loss of grid stability due to failure to invest in alternatives (like South Africa, or Pakistan) etc. But let's leave costs aside. The interesting part is the benefits of Hansen's program. Oddly enough, no one had any scientific information whatsoever on the likely effects of *reducing* carbon emissions. In fact, a number of people bristled at me for having the gall to even ask for numbers. Jason Bradford said my question was "absurd"... "not to be answered seriously". CLIMATE GURUS: Here's the plan for addressing global warming. ORDINARY JOE: Okay. If we implement the plan, what effect will it have on the temperature? CLIMATE GURUS: Are you joking? What a stupid question. So why bother? It's like religious ablutions, or praying, or something. Why go to all this trouble and expense to do something that has no causal impact on any of the specific things people are worrying about? In a world where there are real problems that money can solve, why should money be wasted on something that solves no problems at all? Would you pay for an operation if it was really expensive, and wouldn't materially affect your symptoms for 150 years? Would you buy expensive pills that started working after you died? If we shut down all fossil fuel burning tomorrow, will we see any noticeable benefits in our lifetimes?